Jake Spraker had the most liked content! YEH WE JUST RAN MALTA 10 RACES 3 WINS, 3 SECONDS, 3 THIRDS, AND 1- 4TH AT BRETTS BIG SHOW NOT BAD FOR A STACKED FIELD !! RIGHT DANNY ? AND AT THE TIME IT WAS A SMALL BLOCK TRACK AND WE HAD A BIG BLOCK !!! I AM KEEPING A " KILLER CRATE KILLER" FOR THE BOWL I SELL THEM FOR $7,900. WITHOUT EXHAUST SYSTEM !! MY 3YRS. IN CRATES WE HAD 76 WINS !! YEA JUST SAY NO WE DON'T WANT A CHEAPER BIG BLOCK SO MORE CAN RACE !! Best looking car at Volusia? THEY LOVE PICKING ON HIM !! IT HASNT DRAWN A CROWD IN YEARS !! 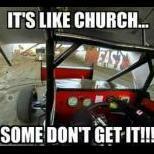 MOST RACERS HATE THE SURFACE !! GUYS I WON MY FIRST RACE AS A CAR OWNER IN 84 AT VOLUSIA IT PAYED MORE THEN !! well I'm new to this game SO LETS HAVE YOU TELL ME ALL ABOUT PURSES COST OF FEILDING A RACE CAR !!!! YES AND New York APPLES ARE BETTER THAN FLORIDA 0RANGES !! I FEEL SORRY FOR PROMOTORS THAT PAY MORE MONEY HERE IN THE NORTHEAST AND DONT GET MANY CARS ,BUT GUYS WILL TRAVEL TO FLORIDA FOR A GRAND TO WIN SHAME ON YOU GUYS !!!! BY THE WAY I DIDNT KNOW ROCKY WAS RACING THERE BUT I WILL TELL YOU One THING ITS NOT MY CAR !!! SHOULD GE A GREAT SHOW ON ONE OF THE BEST TRACK AROUND !!! !